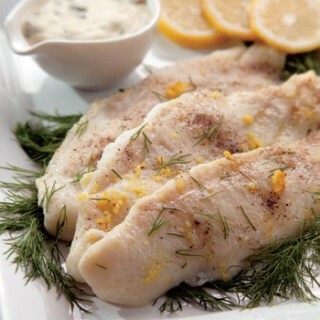 Enhance catfish fillets with a zesty sauce made with Dijon mustard and dill. Sprinkle catfish with garlic salt and lemon pepper. Place catfish on the greased rack of an unheated broiler pan. Tuck under any thin edges. Broil 3 inches from heat for 4-6 minutes or until fish flakes easily with a fork. To make the mustard-dill sauce, melt butter in a small saucepan. Stir in flour. Add milk all at once. Cook and stir until thickened and bubbly. Once bubbling, cook for 1 minutes, and then stir in remaining ingredients. Serve with broiled fish. Nutrition Facts for Catfish (per serving): Calories – 218, Total Fat – 12.2g, Protein – 25.0g. Nutrition Facts for Mustard-Dill Sauce (per serving): Calories – 113, Total Fat – 7.8g, Protein – 3.7g, Vitamin A – 10%, Vitamin C – 9%.